Getting an injury can be devastating if you enjoy exercising or competing in a sport. You lose your physical and mental outlet, part of your identity, and a big portion of your support system when you go down in pain. The emotional and physical devastation is especially powerful if the injury is so severe that it requires an amputation. The surgical removal of a part of your body does not mean that you can't continue playing the sport you love though, as TBI Law, a specialist in hospital negligence claims, explains in this article. Thanks to improved technology, better physical therapy, new paraplegic sports organizations, and powerful persistence you can continue your athletic career. Read on to learn why there is still hope for amputee athletes. We can’t think of a more inspiring story of an amputee athlete returning to sports than rugby player Charlie Lewis. He was only 19 years old when he had an accident while riding his snowboard down a mountain range in France. The incident saw Charlie catapulted 50 meters down the slope, with his leg shattering along an eight-centimeter length of bone upon impact. At first, metal plating was used to keep the bone in place. A few weeks later though, Charlie had to undergo reconstructive surgery after the plating started to break down. The issues would continue for him though and he had undergone nine separate operations on his leg by the time he reached 21 years of age. Charlie had thought about amputation then, but the surgeons at the time encouraged him to try more reconstructive surgery before opting for the life-changing surgery. When he was 29 years old though, the decision was made for Charlie to have his right leg amputated from below the knee. The operation took place in January 2014 and by mid-summer, Charlie had been provided with his running prosthetic and competed in his first triathlon with no prior training. How did he make this amazing comeback? The prevalence of people getting back into sport after they have had an amputation has been highlighted in the study titled ‘Return to sport following amputation’, which was published in The Journal of Sports Medicine and Physical Fitness August 2014 issue. 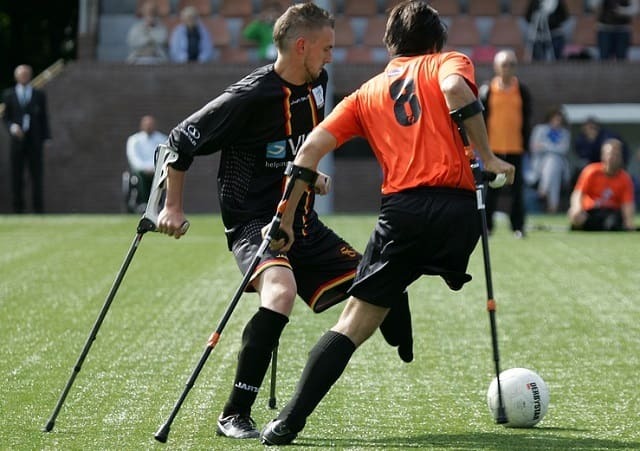 In the research, it was revealed that there is a decrease in people participating in sporting activities after an amputation. In fact, reports from America suggest that 61 percent of amputees will partake in some form of sport, while in Europe this rate is said to be at between 11 and 39 percent. It must be noted that the studies from America involved the analysis of younger amputees than the European studies. However, the study went on to state that there have been more opportunities created for people to get involved in sport after they have suffered from limb loss over the past few decades. In the report, it is acknowledged: “The use of sporting activity for rehabilitation of amputees was first introduced in 1944 at Stoke Mandeville Hospital. The first international Paralympic Games were founded in 1960, originally focusing on sports utilizing wheelchairs. In 1976, ambulatory sports were included and the Games have evolved since then. The growth of the Paralympic Games makes for a particularly intriguing read. At the inaugural Summer Games in the Italian city of Rome in 1960, there were 209 athletes representing a total of 17 countries who competed across eight sports consisting of 113 events. Fast forward to the Rio 2016 Paralympic Games, these numbers had increased to 4,328 athletes representing 160 countries. These athletes competed in 22 sports consisting of 528 events. The Winter Paralympics Games’ history is interesting too. At the first Games in Ornskoldsvik in 1976, 198 athletes representing 16 countries contested in two sports made up of a total of 53 events. At Sochi in 2014 though, there were 541 athletes from 45 countries taking part in five sports consisting of 72 events. Following a medical amputation, people will see both their exercise routines and capabilities change when attempting physical activity again. Therefore, take some time to prepare ahead of your first bout of exercise. Consider which type of physical activity you want to get involved in as some sports may be more difficult to get straight involved in depending on the type of amputation undertaken and physical therapy needed. In general, walking and swimming are advised due to the fact that they require nothing more than some initial prosthetic training. Walking also appeals as it’s an activity that can be done anywhere and at no cost at all. Book an appointment with a doctor ahead of starting an exercise program too. This is because they will be able to prescribe a stress test so that those with an amputation will know just how intense their exercise should be. Also inquire with a medical practitioner about them creating a safe exercise program tailored around your abilities. When it comes to getting involved in sport, make sure to wear loose and comfortable clothing and take note about how the body is feeling throughout any physical activity — the participant should be able to hold a conversation as they exercise and not suffer any pain once an exercise routine is complete. It is best to refrain from exercising when the weather is particularly hot or cold as well — extreme weather is only going to put more stress on the body. If you have an amputated limb you certainly don't want to put unnecessary additional stress on other parts of your body to the point of chronic pain and injury. If you're an athlete dealing with an amputation, it doesn't have to be the end of the road. Your athletic career in the sport you're passionate about can continue thanks to new technology and a lot of determination. I hope you enjoyed this article about why amputees can still have an incredible athletic career while staying healthy and frugal. Interested in more articles about sports sports medicine?